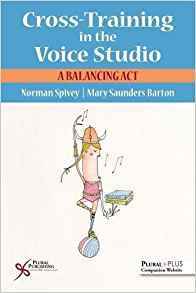 Voice faculty member Norman Spivey and faculty member emeritus Mary Saunders Barton have written a book published by Plural Publishing titled Cross-Training in the Voice Studio: A Balancing Act. The book is available for purchase from Amazon.com as well as from the publisher's website. The publisher's website describes Cross-Training in the Voice Studio: A Balancing Act as "an innovative resource for teachers and students of singing in today's evolving professional landscape. Saunders Barton and Spivey offer an inside view of their applied studios and the results of the cross-training process. As vocal performance demands continue to change, singers must adapt in order to stay competitive in the job market. The authors address this challenge and provide a practical technical approach to developing the most flexible and resilient singing voices - the essence of their philosophy of "bel canto can belto," embracing classical and vernacular styles. Cross Training in the Voice Studio: A Balancing Act is a must-read for anyone in the singing profession seeking insight on cross-training."